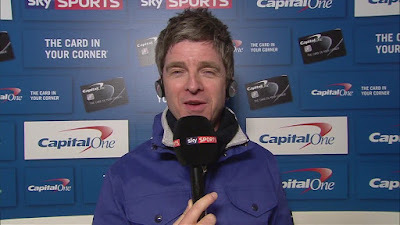 Taken from Noel Gallagher's interview with talkSPORT listen tot he interview here. 'He seems to be sinking at the minute and if he's asking for the press to give him more respect, then this is the start of him unravelling. 'When I was growing up and Liverpool were the best team in the 80s, you couldn't even envisage they would go 20-odd years without winning the league. 'In the 90s when United were winning three in a row and Champions Leagues, and doubles and trebles, you couldn't envisage United going 10 minutes without winning the league, but it does happen. On Manchester United's plans in the transfer market. 'I think the difference between the two clubs is that City have bought incredibly well, even the squad players are amazing. United have just gone for expensive players. 'They went after [Alexis] Sanchez because City were after him, they went after Fred because City were after him, they went for [Paul] Pogba because everyone else was after him. There doesn't seem to be any plan there when they're buying players for the future and that is a big difference. On Manchester City looking 'even better' this season. 'I went to the first game against Arsenal and I actually thought they looked better than last season in some respects. With the team being so young with Sterling, [John] Stones and Sane they're only going to get better. 'The only difference between these two seasons is last season we got the breaks along the way, although saying that I've just been watching the Man City documentary and I forgot how many injuries we had. 'I think the two respective teams's starting XI are pretty well matched now but our bench gives us the edge. 'I looked at ours against Arsenal and it was absurd. There was £200million worth of players on the bench. 'Any team finishing above us is going to have to have a perfect season, not a great season, a perfect season because there are a lot of points to make up. On why the Champions League is not 'an obsession' for Manchester City. 'I think I was listening to people saying that the Champions League will become an obsession for the club, but I can assure you it hasn't. For the fans, it's all about the league.